The Iranian government has intervened to try to stop the screening of a film in the Netherlands about the Koran. The Iranians say that the film, by the Dutch member of parliament Geert Wilders, is offensive. The Iranian justice minister, Gholam Hussein Elham, wrote to his Dutch counterpart, Ernst Hirsch Ballin, calling for a ban. Mr Hussein Elham said freedom of speech should not be used as a cover for attacking moral and religious values. Mr Wilders says his film will show the Muslim holy book is an inspiration for murder. But the Iranian justice minister says it is an unnecessary attack on what Muslims regard as the holiest of things. He said the motivation behind the film was satanic and urged the Dutch government to stop its screening. 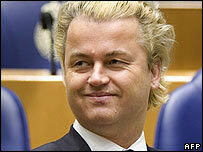 Mr Wilders has already been advised that he may have to leave the country for his own safety. But the government has so far refused to intervene, saying the issue is one of freedom of expression. In 2004, the Dutch film director, Theo van Gogh, was killed by a Muslim extremist in an Amsterdam street after bringing out the film Submission. It dealt with the issue of abused Muslim women and included scenes of nearly naked women with Koranic texts engraved on their bodies.